Who Were Those Three Wise Men of Christmas? The Bible story of the three wise men is very familiar is today’s culture. Most of us have grown up seeing the nativity scene of the stable where the Christ child was born, with the three wise men readily offering their gifts to the infant. The Book of Matthew tells the story of an unspecified number of wise men who traveled from the east, following the Star of David, to bring their gifts of gold, frankincense, and myrrh to the Messiah. But is there more to the story of the wise men than meets the eye? The three wise men are some times referred to as ‘kings’. However, in the Bible nowhere are the ‘three wise men’ called kings. Some historians believe that the idea that the three wise men were kings come from another Biblical quote regarding the coming of the Christ or Savior – "May all kings fall down before him" (Psalms 72:11). Somehow the idea that these wise men were ‘kings’ also became part of a famous Christmas song, We Three Kings of Orient Are published in 1863. The other name this Christmas song was published under was The Quest of the Magi … and that is exactly what the Bible called these three wise men, Magi. Magi were spiritual, metaphysical men who were typically astrologers. But the magi were also familiar with other forms of divination. 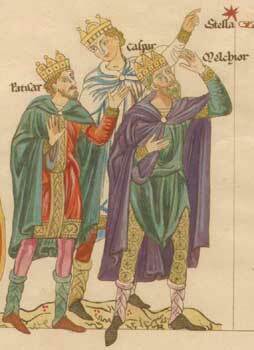 The original magi were highly valued by the Babylonian kings for centuries. The word ‘Magi’ is sometimes even translated as ‘astrologer’. In Matthew’s account of Christ’s birth the wise men from the East are called ‘Magi’. It was possibly a doctrinal debate that started the use of the term ‘wise men’ since astrology is considered by many traditional Christians to be inherently evil or forbidden by God. However, more open minded Christians find nothing inherently evil about astrology and cite Genesis 1:14 as a reference. In Genesis it states that God made the heavenly bodies and "set them in the sky as a sign". Certainly Matthew seemed to have thought along these lines for he described the wise men as magi or astrologers who were following a star in pursuit of something prophetized in the stars. The traditional Nativity scene (though wonderful to behold) may not be entirely accurate where the three wise men are concerned. The Bible suggests that the star appeared when the child was born. Coming from the east, it likely would have taken the astrologers a long time to reach Bethlehem. In fact, when the three wise men arrive in land of Judah, Herod the king asked the astrologers when the star had appeared so that he could know when the child was born. Herod said he wanted to pay homage to this new ‘king of the Jews, and asked the magi or three wise men to inform him should they find this child. However, Herod’s real intent was to see that this prophetic child was killed to protect his authority and the rule of Rome. After the astrologers had seen Christ, they went back home by a different route having been warned in a dream what Herod’s real intentions were towards Jesus (which seems to further solidify these men were indeed magi familiar with divination and dream interpretation). Herod, in an angry rage that the magi had, had all the male children two years old and under in Bethlehem killed, "according to the time that he had carefully ascertained from the astrologers" (Matthew 2:16) By the time the astrologers followed the star to Jesus, he may have been nearly two years old. Matthew 2:11 says that "they went into the house" where Jesus and Mary were for they had long since moved out of the stable. Matthew’s account of the three wise men as astrologers may not, however, be the only one in existence. An ABC News report found that an ancient text, called the Revelation of the Magi, may provide some more clues about these men. Discovered by religious expert Brent Landau in the Vatican archives, this text supplies much more information about the astrologers than Matthew’s brief mention of them. According to this newly found religious text, these magi were descendants of Seth, Adam and Eve’s third son. The land of the east from which they traveled was probably China. Following the Spice Route that leads from China directly into Bethlehem and was possibly the path they used. The Revelation of the Magi goes on to describe the astrologers as practicing rituals and possibly some sort of divination until the Star of David appeared in the sky. The star led them to Bethlehem, into the house where Mary was staying, and literally turned into the Christ. Jesus, no longer a celestial being but in human form, then announced that he had "appeared to the peoples of the world" before. Landau suggests that this story, possibly an early Christian work of fiction, was a story of hope to people of many religions. Today, the remains of the three wise men (or astrologers, or magi, or whoever they were) are thought to be located at Cologne Cathedral in Cologne, Germany. You can visit the Shrine of the Three Kings at the cathedral which was built specially to house the shrine. It sits behind the high altar, its three attached sarcophagi the focal point of the cathedral. The shrine was built some thousand years ago and well after the birth of Christ. And, while eyewitnesses saw the bodies being put into the shrine, a great deal of historical debate continues as to whether or not these bodies were indeed those of the three astrologers. Throughout this article the term ‘three wise men’ as been used. In truth, the bible doesn’t say who or how many wise men there were. All we know is that these men came from the East, following a star, and most likely their journey took considerable time. We know they likely we not present at the time of Jesus’ birth, more likely they arrived when Jesus was a year old or older. We know these wise men recognized the birth of Jesus as a significant event. We know that the wise men were referred to as magi who were noted for their divinational skills, in all likelihood they were astrologers. Now, you may be tempted to toss out your nativity scene given what we now know today about these mysterious wise men. Well, don’t. The nativity scene is about a message, and that message is the same whether there were three wise men, or kings, or astrologers or whoever. It doesn’t matter that they were most likely not present at the birth of Jesus. What is important is message: "Peace on Earth, good will towards men". Should you be looking for a clairvoyant astrologer ready to answer questions about your future, give Clairvoyant Astrologer Peg a call at 1-800-806-5899. Peg is great to talk with and would love to answer any and all of your questions. For a psychic who really loves Christmas, give Psychic Rheda a call at 1-866-407-7164 (toll free USA and Canada). Rheda is a born clairvoyant and a Christian Minister who excels at helping those who need answers and/or guidance.